Home › digital philately › Digital Philatelic Studies, Why Aren’t There More? Digital philately grew into adolescence when Digital Philatelic Studies (DPS) became recognized in the hobby a few years ago. There were a few competitions, and it appeared digital studies were finally on their way to acceptance as another avenue to increase enjoyment of the hobby. DPS bloomed quickly, but faded as the number of people interested failed to expand. That’s too bad, as philately could have benefited greatly from DPS being included under the umbrella of philatelic literature. So what hampers digital studies from becoming more popular? It could be collectors find the effort to develop a digital study with meaningful depth simply overwhelming. The time to reach an ambitious goal is long and the satisfaction of a job finished and appreciated may never be realized. I’m not saying that digital studies are an improper format or treatment for a collection or an exhibit, but rather, collectors may become disenchanted having to extend what they perceive as a herculean effort to develop one. What other reasons may there be? Perhaps one might be that developing studies requires expensive technologies. Exercising unfamiliar skills could dampen enthusiasm. Another may be doubting the worth of anything less than a book-sized reference guide. Still another could be the belief that digital studies are not ‘true’ philatelic exhibiting by the classic standard or worse still – aren’t ‘real’ literature. Those reasons are very unfortunate and indicative of a short-sighted view. Many differences of opinion and misunderstandings contribute to the current neglect of digital studies and perhaps a simplified method of approaching them might work better. Not everyone wants to write a book, but we all enjoy sharing our favored children. I’ve been experimenting with an interpretation of digital study development through expanding short vignettes over time. This is NOT a groundbreaking revelation or an original discovery as others have done this through article and web site updates for many years. It’s simply me saying I’m personally experimenting and sharing my thoughts. I now have what might be enough to demonstrate by example what I mean using a single cover below as the starting point. Subject of a blogpost and expanded four page exhibit. I find it interesting to describe a single item from my collection in detail not afforded in an exhibit due to the brevity of an item’s description on an exhibit page. The advantage is a limited amount of material to research and in every instance, this approach has increased my knowledge and appreciation of the item. I include as much detail as I wish to explain the story behind the item. By writing in this fashion, I produce a short ‘mini-article’. Time to accomplish this is minimal and I enjoy the ‘immediate gratification’ factor as well. Examples of this method are easily done in simple blogposts. I prepared a simple one for the Wyoming Territory cover (October 2013) and show it on my Mesozoic Times blog Wyoming Territory – Fossils in the Badlands. Taking this to the next level, I add a deeper level of information and a few stamps to enhance the story. This only works if you strictly illustrate storyline points, keeping the focus on the original item. When I did this for the Wyoming cover (December 2013), it resulted in a post that was informative, educated me on the item’s background and allowed me to be more creative. This second method is more in-depth but still takes little time and expertise. 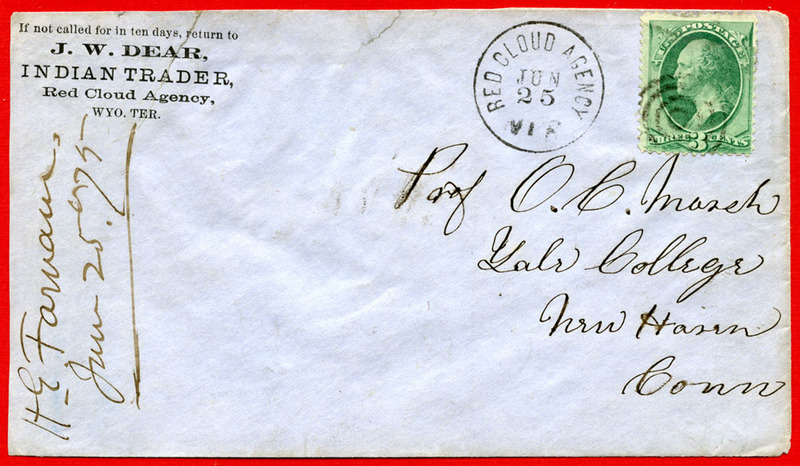 The example of this expanded post based on the cover from Wyoming Territory is O.C. Marsh, Chief Red Cloud and the Thunder Horses. As you’ll notice, there are no page breaks. This is a blog post format and the page simply scrolls downward. It is only available to view if you are connected to the internet. This method showcases individual items and can demonstrate a collector’s depth of philatelic knowledge like few other methods. U.S. Fancy Cancels with Ammonite Design is an example of a vignette with more depth. That’s not to say that digital files can’t be used to mimic physical pages as well. One only needs to format the text and materials to fit on paper pages. In this case, I decided to expand the blogpost (February 2014) using additional material to amplify the storyline even further, but retain all of the text I needed for a ‘picture book’ treatment. (Note: this method flies in the face of conventional competitive exhibiting techniques. This is an informational display for viewers.) I used as many U.S. stamps as possible to reflect the subject and different philatelic elements to enhance the viewer’s exposure to the variety of material available. This example was created using the information and images from the second step and resulted in four pages – O.C. Marsh, Chief Red Cloud and the Thunder Horses. You’ll notice this document is in a pdf file format and can be downloaded to your computer for viewing even when not connected to the internet. This format can also be printed and exhibited as a single row exhibit was done at Sandical 2014 along with 3 other row exhibits. Visitors enjoyed the variety of these row exhibits and feedback was quite complimentary. The next iteration of this experiment will convert the pdf pages into a self-contained document. You won’t need reader software to view the file as it will automatically open on its own. You’ll flip the pages and use the embedded links like an electronic book. I’ll be experimenting with this format in the future. Converting an existing paper exhibit to a digital vignette can also be done, scanning the original pages into pdf or image files. Better quality can be obtained by scanning items and placing the images directly into the application of choice, usually a word processing or page layout program. An example is – The Angakok Spirit Mask (a single page). I scanned the items, placed the images in the page layout file and then generated a pdf file. So how do vignettes relate to DPS? Vignettes are simple DPS building blocks. The ultimate advantage of electronic files is being able to update them with new information or material and manipulate the content in different ways. Files are viewable on PCs or Macs as well as tablets. Individual vignettes can be updated or expanded easily and the new information made available on the web immediately. Combining small vignettes accumulated over time into a more formal structure can result in a mature DPS. I hope this blogpost sparks your interest in building vignettes. I wish you the greatest success with your digital masterpieces, but even if you never combine vignettes into a full blown DPS, it’s still great fun and well worthwhile sharing your favorite children.